In the high-revving world of NASCAR, numbers carry great significance. Most drivers love looking over their stats, especially those numbers piling up in the wins column. They also like to see high numbers when they set a track record speed. And certainly lowering those track lap time numbers are critical for success. But most of all, NASCAR drivers are branded by a number that transcends all others: The one that's emblazoned on the side of their race cars. That number becomes their calling card. Their unofficial team logo. Their signature. 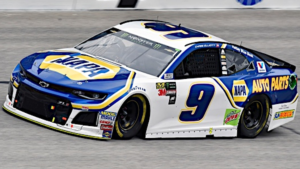 So when third year Monster Energy Cup Series driver Chase Elliott had the chance to be reunited with his favorite number, the No. 9, during this past offseason he jumped at it. Elliott will return to Bristol Motor Speedway for the Food City 500 weekend, April 13-15, driving his Hendrick Motorsports Chevrolet ZL1 with a family heirloom of sorts on the side of his car. You see, to Elliott, the No. 9 is so much more than just a number. It's a family tradition. One that he's proudly displayed every time he's had the chance as he made his way up through the racing ranks. In 2014 he won an XFINITY Series championship driving the No. 9 for JR Motorsports. His father Bill, known more for his impressive 200-mph plus dominating performances at the superspeedways, raced to his lone Bristol victory on the famed high banks 30 years ago, taking the checkered flag here in 1988. In fact, during his career, Awesome Bill from Dawsonville posted only two short track wins out of his career total of 44, also finishing first at Richmond in 1992. That effort by Bill in 1988 remains the one and only time in NASCAR history that the No. 9 has visited BMS Victory Lane in the Cup Series. In a few weeks, the younger Elliott hopes to change that stat. Chase, who drove the No. 24 in his first two Cup seasons, is happy to have the No. 9 back where it belongs. "It is special to me just because of the history I've had with it," Elliott said. "Obviously I would have never chose that number to start racing if it wasn't for my dad. I have a lot of history with it myself, with our (XFINITY Series) championship in '14, all my short track races, was all in that number. There's a lot of time I've spent with the number, a lot of photos and races and things that I've run with it. It's just kind of home to me. Always been my favorite number. If you could choose your favorite number to race, I think everybody here would, wouldn't you? So, yeah." Elliott will be the 15th driver to race the No. 9 on the high banks of The Last Great Colosseum. And his chances of grabbing a win here are pretty good. He grew up immersed in short track racing and cut his teeth in the Late Model Stock scene. His career stats at Bristol are solid. At the Cup level he has posted two top 10s in four career starts with a best finish of fourth in the 2016 Night Race. During his XFINITY days at BMS he earned four top 10s in four starts. He won his lone Truck Series start at Bristol in 2013. Elliott firmly understands the unique demands that The World's Fastest Half-Mile presents. "Bristol is a physical place," Elliott said. "You don't have a lot of time down the straightaways to think about things. You very much so get into a rhythm of just running. You don't really have much of a break and it's just wide-open all the time. Knowing how quickly the leader can get back to you to put you a lap down, I think is one thing that keeps everybody on their toes and probably keeps the intensity up." Even if he survives the intensity, getting to victory lane at Bristol is certainly a tall order. Of the 100-plus car numbers that NASCAR issues in the Cup Series, there have only been 31 different car numbers survive the chaos and make it to victory lane over the course of 114 NASCAR Cup Series races at BMS. The No. 11 has been the most frequent visitor, with 19 victories - with drivers Ned Jarrett, Cale Yarborough, Darrell Waltrip and Denny Hamlin earning those wins. A handful of car numbers have made it to the winner's circle on just one occasion. The No. 9 is among that single-win group. There have been 73 entries for the No. 9 at BMS. Others who have driven the 9 at Bristol besides Bill Elliott include Bunkie Blackburn, T.C. Hunt, Roy Tyner, G.C. Spencer, Tony Bettenhausen Jr., Dave Mader III, Lake Speed, Jerry Nadeau, Steve Grissom, Bobby Hillin Jr., Kasey Kahne, Marcos Ambros and Sam Hornish. 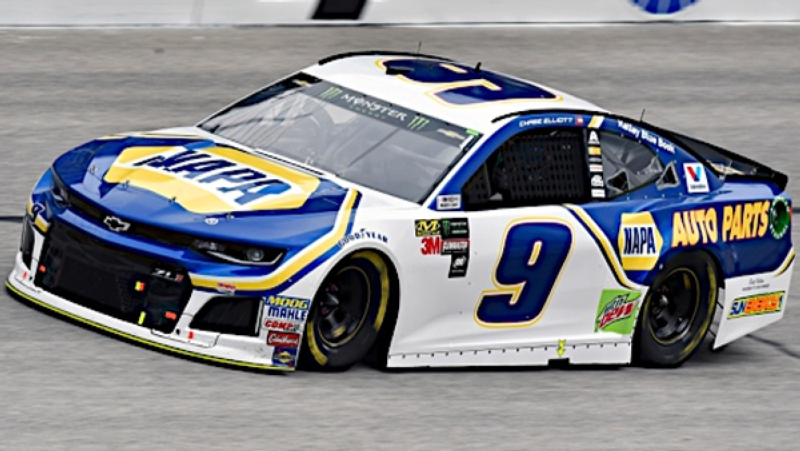 Besides Bill Elliott's lone win, the car number has a pair of poles (Elliott in '91 and Kahne in '07) and 10 top-five finishes. Between 2016-18, there wasn't a No. 9 on the Cup circuit. Richard Petty Motorsports was the last organization to run the No. 9, fielding the entry from 2009-10 for driver Kasey Kahne, 2011-14 for Ambrose and '15 for Hornish. In '16, the organization dropped the No. 9 and switched back to the No. 44 to more closely align with the family's rich racing history. When Hendrick Motorsports underwent a driver change for the '18 season - bringing in William Byron to replace Kahne as well as Alex Bowman as the new driver of the No. 88 for Dale Earnhardt Jr. - officials there saw an opportunity. Byron's No. 5 team became the No. 24, paving the way for Elliott to return to the No. 9. Hendrick was happy to connect the second generation driver to his family racing roots. "I know what the '9' means to Chase and his whole family," team owner Rick Hendrick said.. "They've contributed so much to our sport and I'm happy we can honor that history by bringing the number back. I think fans will really love seeing it out there." Elliott says he's been getting great support from everyone being back in the 9, especially the fans. "I think people see my genuine excitement from it and I think it excites them," Chase Elliott said. "That's kind of the vibe I've gotten - people see that and I think they can connect more with that." When you buy tickets to Bristol to cheer on Chase Elliott racing in the famed No. 9, you'll definitely want to take advantage of so many fun activities to make a complete weekend of family fun, including great video entertainment provided by Colossus, the world's largest center-hung video screen, premium VIP experiences like the Chairman's Experience, tailgating, on-site camping, concerts, great food and beverages in the concession stands throughout the property, and so much more. And for families who want to bring the entire clan, Bristol Motor Speedway officials are making it easier than ever for kids to have an awesome experience. Kids' tickets (12 and under) are free and adult tickets are $5 for Friday's (April 13) Bush's Beans Pole Day. On Saturday (April 14), kids' tickets are free and adult tickets start at $30 for the Fitzgerald Glider Kits 300 NASCAR XFINITY Series race and the Zombie Auto 150 NASCAR K&N Series event. On Sunday (April 15) adult tickets start at $60 for the Food City 500 and kids' tickets are $10. For all races, each child must have a physical ticket in hand to enter the gates. The Bristol Motor Speedway ticket office is the only authorized location that can produce the free kids' tickets.